Black women were big winners during the 2018 midterm elections, but there was one we couldn’t keep our eyes off as the results rolled in. After keeping a slightly lower profile since the fallout following the Democratic National Committee debacles of 2016, Donna Brazile reemerged with a stunning new look last Tuesday, replacing her well-known cropped curls and typically fresh face with a sleek silver bob and sophisticated, face-sculpting makeup. The results were beyond flattering; social media gave Brazile’s new look a standing ovation. We gave her one, too. So, of course, we had to reach out to her hair and makeup team to find out what prompted her gorgeous transformation. 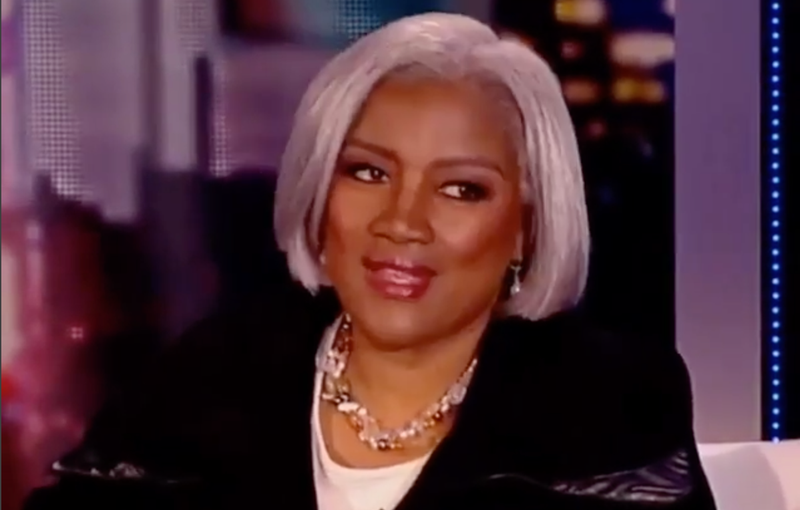 Brazile’s new look came courtesy of two regulars on ABC’s beauty squad: hair and makeup artists Dior Sovoa and Elena George. Sovoa, who has worked with Brazile for the last year, took the lead on Brazile’s new hairstyle, convincing the political pundit to try a polished, but decidedly more glamorous look, timed to coincide with the new energy flowing into Washington. “I wanted to see if there was some way that I could make her look professional ... but I wanted to focus more on her hair, and the new look going into the new year,” Sovoa told The Glow Up. A Washington, D.C., native, Sovoa is no stranger to the politics of hair. After closing his DMV-area salon to try his hand at a career in New York City three years ago, he quickly landed a job at ABC, styling the Good Morning America team and a countless number of commentators on the news shows. For Brazile, the hair expert—who also has his own line of hairpieces and wigs—custom-crafted a set of clip-ins to create her chin-skimming blunt bob. After a test run with a more silvery look on the previous Sunday’s broadcast with George Stephanopoulos—which Sovoa admits was kind of a “sneak hairdo”—he and George agreed on a subtler and thicker salt-and-pepper finish to seamlessly match Brazile’s hair for Tuesday’s midterms. How did Brazile respond to her makeover? But while it may not have garnered as much attention as the new hairstyle, the look wouldn’t have been complete without a flawless face, created by eight-time Emmy-award winning makeup artist Elena George. George, who has spent 20 years beautifying the faces at ABC, in addition to a long stint with Mariah Carey, has progressively been teasing out Brazile’s natural beauty over the past several years at the behest of Robin Roberts, for whom George is the key makeup artist. It was George who initially introduced Brazile to the eye-enhancing beauty of false lashes—almost a must for television. With the publication of October’s For Colored Girls Who Have Considered Politics, which she co-authored, Brazile needed to reemerge from the 2016 controversy and back into the public eye stronger and sharper than ever—and George was eager to oblige. This time, George was instrumental in helping to convince Brazile to try a new look altogether, including backing away from the Shimmer Lights shampoo that was giving her silver locks a violet cast. Using black-owned brands Pat McGrath and Danessa Myricks, among others, George complimented Brazile’s dramatic hair change with a glowing makeup look that showed off her cheekbones and softened her sleeker new look. To play up Brazile’s bone structure and infuse a subtle glow, she applied highlighter underneath the foundation, giving the look of suppleness to the skin. A stronger eye and sculpted cheeks helped strike the balance between professionalism and a powerfully glamorous shift into a new phase. “We didn’t think that she was going to get the reaction that she did get—she was trending!” George laughed. Next, George is working with Robin Roberts to help Michelle Obama kick off her book tour on Nov. 13, before returning to New York City to host the inaugural Opulence Beauty Affair on Dec. 12 at Sephora’s Times Square location. The theme? Transformation. Just like she did for Brazile, George wants to encourage attendees to try bolder looks they may not have considered. As for Brazile’s new look? George and Sovoa promise that we can look forward to seeing more of the same. Sovoa’s now creating a fuller wig piece for Brazile to create more ease in rocking her new hairstyle. Time will tell if the impact of her makeover provides welcome new energy to her political narrative, but what’s clear is that any time can be ripe for reinvention.